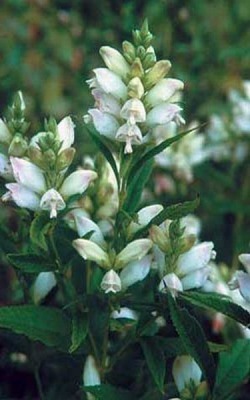 Other common names: Turtlehead, turtle bloom, fishmouth, codhead, salt-rheum weed, snake-head, bitter herb, shell flower. Habitat and range: This native perennial grows in swamps and along streams from Newfoundland to Manitoba and south to Florida and Kansas. Description: Balmony is a slender, erect herb, with a 4angled stem 1 to 3 feet in height, occasionally branched. The short-stemmed leaves, which are from 3 to 6 inches in length, are narrowly lance shaped to broadly lance shaped, the lower ones sometimes broadly oval, narrowing toward the base and with margins furnished with sharp, close-lying teeth. In late summer or early fall the showy clusters of whitish or pinkish flowers are produced. Each flower is about an inch in length, with a tubular, inflated corolla, with the mouth slightly open and resembling the head of a turtle or snake; its broad arched upper lip is keeled in the center and notched at the apex, while the lower lip is three lobed, the smallest lobe in the center, and the throat bearded with woolly hairs. (Fig. 23.) The seed capsule is oval, about half an inch in length, and contains numerous small seeds. Collection, prices, and uses: The herb (especially the leaves), which brings from 3 to 4 cents a pound, should be collected during the flowering period. Balmony has a very bitter taste, but no odor, and is used as a tonic, for its cathartic properties, and for expelling worms.